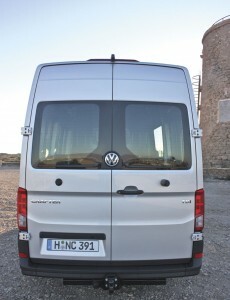 Rob Orchard travels to Andalusia to get a real insight into VW’s exciting new contender. So far VW have played a very canny game with their new Crafter van range. They’ve told us a bit about it and they have let us look at it from a distance but they haven’t let us journos do what we love to do which is get up close and personal with a new model and most importantly get behind the wheel. Now they have, well to a certain extent. The launch of the new Crafter is a bit like peeling an onion, we are being exposed to it a layer at a time. So far they have revealed layer one which is the new front wheel drive 3.5/4.0tonners and given us a little bit of information about the rear wheel drive 3.5/4.0tonners and of major importance to us the 5.5tonners. It will be mid 2017 before we get proper exposure to them. 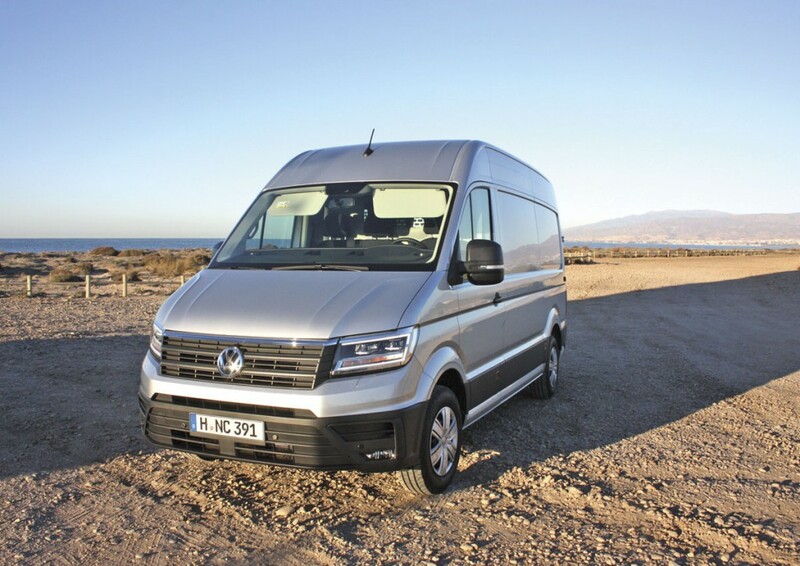 This phased introduction is not surprising, the new Crafter is a massive project for VW. This isn’t simply the replacement of an existing range, it is a completely new range built against a different philosophy to its predecessor. 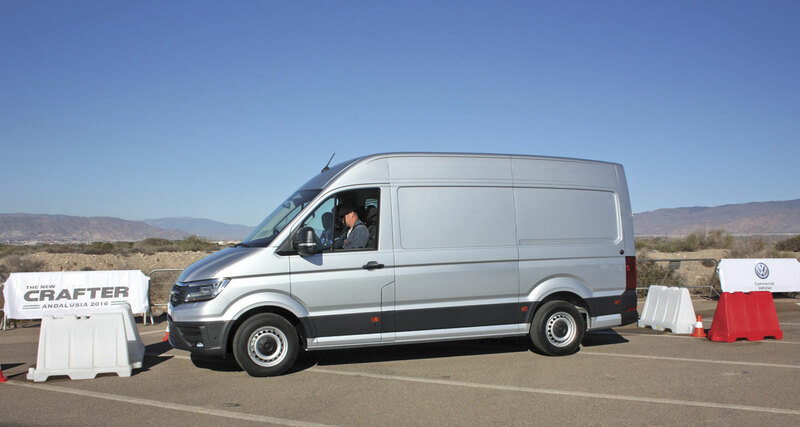 Previously, Mercedes-Benz produced some complete vehicles for VW and supplied all the Crafter bodyshells and the two companies shared some technical details. Not only were VW faced with developing a complete new vehicle, they were also faced with developing a Euro6 power source and perhaps most significant of all somewhere to build the vehicle. It is obvious that early on they decided to not just replace the existing Crafter but to develop a completely new, much wider range of products and to try where possible to get ahead of its rival in the technical aspects and initially it looks as if they may very well have done just that. The new Crafter bristles with innovations, many of them in advance of the Sprinter. There can be absolutely no doubt VW are out to challenger Mercedes-Benz supremacy in this sector. 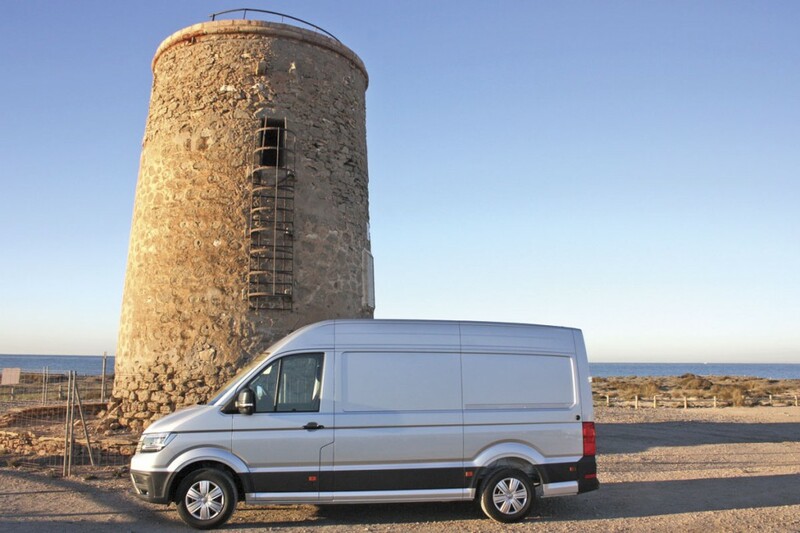 Mercedes-Benz has shown that it will react by upping the gross weight on the Sprinter to 5.5tonnes when it got wind that the new Crafter would be rated at that weight. VW began the process four years ago and to date the project has cost them over £800m. That is serious investment. 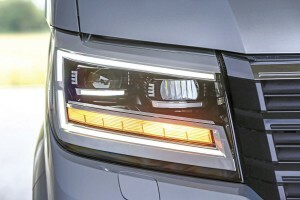 VW did not have an existing facility where it could build the new expanded Crafter range. It did consider expanding existing facilities but in the end decided to go for a completely new plant on a green field site. For a variety of reasons, not least its highly successful car plant at Poznan-Antoninek in Poland, it decided to build the new Crafter plant in that country, not adjacent to the existing car plant but in another part of the country at Wrzesnia. It is a massive plant covering 540 acres (equivalent to 300 football pitches) and is equipped as you would expect with state-of-the art production systems. When fully operational the plant will employ over 3,000 people. Interestingly, a number of key component suppliers are also building facilities adjacently to reduce supply lines. First of all it has a completely new body which has been developed much later than the current though excellent Sprinter body. Secondly it has an excellent engine which has been the subject of major development to achieve Euro6. It is basically a development of the excellent engine developed by VW for the recently introduced T6 Transporter. Thirdly, VW is introducing new eight-speed fully automatic transmissions. The Crafter has never had a true automatic transmission option and the Mercedes-Benz transmission good though it is only has seven speeds. Fourthly, VW have introduced on the Crafter electro mechanical steering which enables VW to offer a range of other assistance packages to benefit the driver, operator and ultimately the passenger. Fifthly, in developing the new Crafter, they have been able to introduce new suspension systems and axles which create a vehicle that has increased internal space and lower floor height. Finally, advanced wind tunnel studies have enabled the VW designers to create a very aerodynamic body which slips through the air and produces impressively low drag, translating into excellent fuel efficiency figures. In styling terms the new Crafter leans heavily and unsurprisingly on the styling of the new T6 Transporter, in fact it looks just like a large Transporter. The lines are clean, simple and classical. The 2.0 litre, four cylinder EA288 TDI engine is a common rail engine operating at 2000 bar injection pressure and has a new high pressure exhaust gas recirculation system and water cooled charge air cooler. The variable intake manifold ensures excellent current swirl during the partial load phases. The engines have an oxidising catalytic convertor which combines a diesel particulate filter and an SCR catalytic convertor. The system uses AdBlue to maintain emission control and overall VW claim the new engines are 15% more fuel efficient than their predecessors. On the higher powered engine option a twin turbocharger is used. Currently the engine is available in a variety of power outputs: 102bhp (75kW), 140bhp (103kW), 177bhp (130kW), but we know there are going to be other options because the 3.5tonnes and probably the 5.5tonnes rear wheel drive models when they come will also have 122 and 163bhp options but won’t have the 102bhp option. There is a distinct possibility that there will also be a power option above the 177bhp on the 5.5 tonner, remember the T6 Transporter is available with a 205bhp version of what is essentially the same engine.. The 177bhp engine (and the 205bhp engine) uses dual turbocharging but it is not clear yet whether the 163bhp version will have this feature. The various engine settings are achieved with rpm levels around 3500 and 3600. Torque figures are equally impressive, the 102bhp engine produces maximum torque of 300Nm, the 104bhp engine 340Nm and the 177bhp engine 410Nm achieved across a wide speed range of 1400 to 2250 rpm. Torque figures for the 122 and 163bhp versions have not yet been issued. All engines have a stop/start function and a back-up battery system as standard. Two transmissions are being offered, the six speed synchromesh manual and an eight-speed fully automatic using the AQ450 unit which has been specially developed for the vehicle. The rear wheel drive models will also be available with both six-speed manual and eight-speed fully automatic transmissions but using a different automatic box the AL550. Developed off the back of the suspension designed for the new T6 Transporter, the Crafter’s front suspension is a Macpherson strut independent design. The front axle load on the 3.5 tonners is 1.8tonnes and 2.1tonnes on the rear. On the rear wheel drive version the rear axle capacity will rise to 2.25tonnes. The four tonner has a rating on the rear axle of 2.38tonnes. The electro mechanical steering is a speed adjusted electrically assisted system which works only when it is needed. It reduces fuel consumption which also means reduced CO2 emissions but it also allows VW to offer some really interesting additional optional systems . Braking uses 303mm ventilated discs all round with 16in callipers. The cab interior is not flashy, it is as you would expect clean, simple and functional, (dare I say Tutonic?). Some people thought it a little bland but I didn’t. I thought it was well laid out and unfussy. The dash is clean and simple but it is also very well laid out with clear instrumentation and perfectly positioned instrumentation and controls. It is well equipped with electric windows, remote adjustment of the mirrors, all the electronics you would expect of a new vehicle but far too numerous to list here, reverse view camera and sensors plus lots of useful storage for driver’s bits and pieces. Needless to say there are sockets and charging points for all modern systems plus wi-fi compatibility. There is a vast range of in-vehicle entertainment systems available and similarly a wide range of information technology systems available. The 3.5 tonnes front wheel drive version is available in three vehicle lengths. 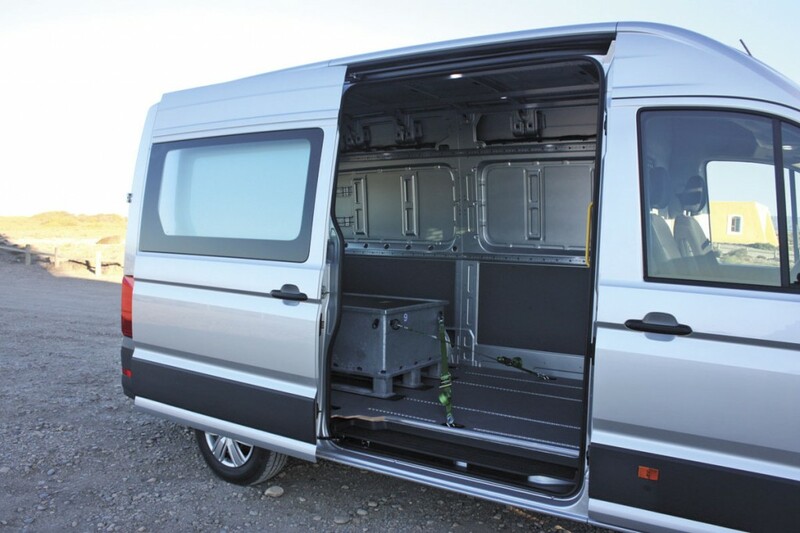 The panel van is being offered as a mid-length wheelbase version with a length of 5986 mm, a long wheelbase version at 6836 mm or as an extra long at 7391 mm. There are also three different heights available. The Customer Functional Control Module offers customers a wide range of features which can be specified on the vehicle. It is only possible here to list a few examples of the multitude of features of these control modules. They vary from a roof sign lighting function for ambulances, through a generator charge checking function, a total discharge status indicator and a working speed regulator, to speed restriction, deactivation of the automatic engine stop-start system and much more. Compared to the previous Crafter, the new CFCM offers more digital inputs, twice as many analogue inputs and new to this version, 24 outputs. In addition to the free programmability and freely configurable inputs and outputs already mentioned, plus the range of set functional packages (e.g. working speed regulation), the new base variant also offers monitoring of the second battery. The new Crafter absolutely bristles with safety systems. Many of the safety systems like ABS, ESP, BA, Lane Guard etc are standard but the use of electromechanical steering has enabled them to introduce other active driver assistance systems, such as Lane Assist, Park Assist and Trailer Assist. There are also systems (some optional) like Adaptive Cruise Control (ACC), Front Assist emergency braking system, Automatic Post-Collision Braking System and side wind compensation system. In terms of passive safety too there is an extensive range of warning systems available for the driver. In addition to front, side and head airbags, these include reversing camera, a parking distance monitor, Rear Traffic Alert, Front Assist which controls the vehicles distance and speed from the vehicle in front and automatically takes action if the driver fails to do so, sensor-based side protection system and Driver Alert which senses tiredness in a driver. Additionally there are LED headlights, cornering lights and Light Assist to ensure a clear view of the road ahead at night. 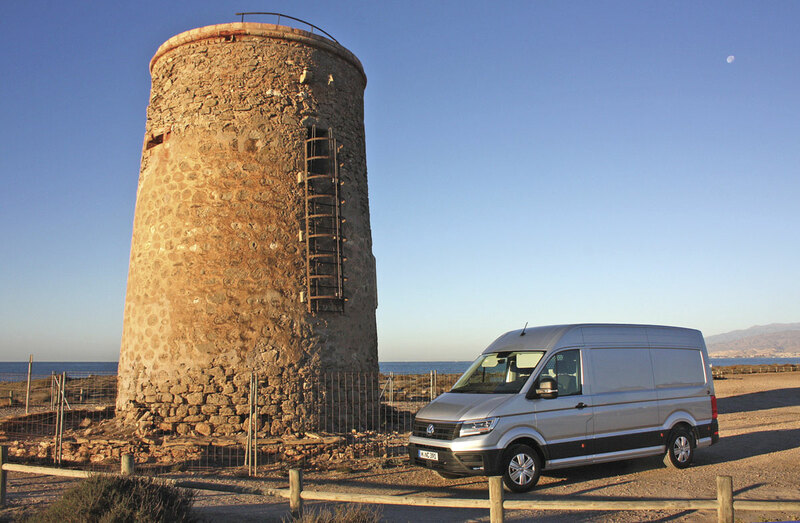 To enable us journos to get to test the new Crafter in ideal conditions, VW took us to Almeira in southern Spain. Not exactly the most scenic part of Spain being little more than a desert. That scenic aspect is made even worse by the fact that the area is Spain’s principle vegetable growing area so all you can see are miles and miles of huge polytunnels. Significant buildings are a massive prison and the headquarters of the Spanish section of the Foreign Legion! Spain is developing this as a tourist area and there is lot of building of hotels etc. Can’t say it would appeal to me, but then we weren’t there for the scenery, we were there for the weather and it didn’t fail on that score. Clear blue skies and a temperature of 25 degrees, a welcome change from the -5 degrees I left in Cumbria! A whole raft of new front wheel drive 3.5 tonnes Crafter vans were available for us to drive and unusually they were all loaded to the correct weight and we were allowed to drive them unaccompanied. I chose the longest vehicle available with the highest engine power, 177bhp for my first drive as I felt it was the closest I could get to the type of vehicle which will form the bulk of UK minibus conversions once the 5.5tonners are available. I drove the manual first followed by the automatic. First impressions were of a very stylish yet understated vehicle with simple, clean lines. I mentioned the cab earlier, it is simple, well equipped and comfortable. I liked the simple clean dash, the clear instrumentation and the well laid out controls and instrumentation. The seat was very comfortable and it was easily possible to achieve the ideal seating position. Electronic adjustment of the very good sized rear mirrors soon had me ready for the road. The screen is wide and the front pillars do not intrude. However one thing which I did not like and which surprised me was that the side windows are actually split into two sections. 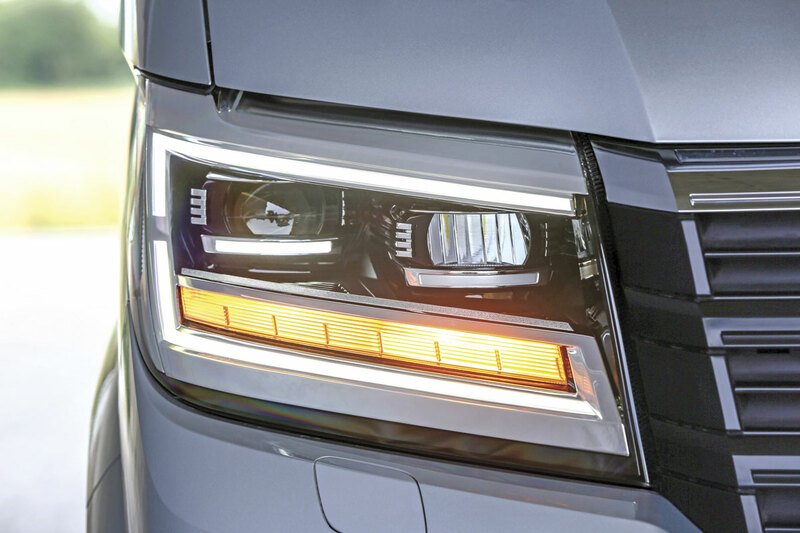 A fixed front quarter light and an electronically operated opening second section. I found it surprising that the side window was not a single piece of glass. I know that Sprinter has a similar arrangement and it annoys me on them as well. We were given a route to follow which would take us out into the desert like terrain and thankfully this was backed up with a reasonably accurate Sat-Nav otherwise I might still be driving around Andalusia! Easing out of our base I took a few minutes to acclimatise myself to being on the wrong side of the road before beginning to assess the vehicle. Although the area is desert like, it isn’t that flat and there are plenty of short sharp hills and descents to deal with. You are struck straight away by the power of the engine. Remembering that this vehicle was fully loaded, there was no lack of performance and masses of available torque to cope with the hills. At the bottom of the box the engine note is a little harsh but as soon as you have passed second, that disappears and the engine becomes very quiet the more you build the speed. The transmission had well spaced ratios and was clean and smooth in operation. We’d been told a lot at the press conference about the new electro mechanical steering and it was very impressive. Steering was light yet not too light, very accurate in terms of positioning, easy and smooth. It was absolutely precise. The roads we were driving on were lightly trafficked so on the first decent descent I decided to do an emergency stop with this fully loaded vehicle. I built the speed up and then hit the brakes. It virtually stood on its nose stopping rapidly and without any deviation. Sorry VW, I left a little of its tyre rubber on an Andalusian road. The road holding thanks to the MacPherson strut front suspension was excellent and the ride over what were far from flat roads was very comfortable. We weren’t supposed to be going on to the motorway but a mis-direction by the Sat-Nav (that’s my excuse) saw me on the motorway heading for Granada. I took full advantage by taking the Crafter up to full cruising speed. The vehicle wasn’t speed limited but I was a good boy and kept it at the 100kph mark. I have to say it cruised beautifully and I nearly decided to carry on to Granada rather than again being a good boy and coming off at the first exit and re-joining in the opposite direction to get back on my route. I drove the vehicle for about two hours and it was a real pleasure. It is a beautifully balanced vehicle. Following that vehicle I drove a similar one but fitted with the new eight speed fully automatic transmission on a much shorter trip. It was a delight, beautifully smooth almost imperceptible changing and gears spaced perfectly. The box that will go into the 5.5 tonners is slightly different but I have no reason to think these characteristics will be any different. Following that, I got the chance to experience for myself some of the new safety systems being offered. I should mention that I had already experienced the Driver Assist system during my long drive when I found myself having to negotiate a stretch of narrow road which had parked cars on one side and a very solid looking wall on the other. The gap available was just wider than the van but the audible bleeps from the warning system made sure no contact was made. On the special tests I first experienced the Side Protection System. This is designed to prevent those annoying knocks that happen low down on the front and rear corners and side cills. We were given a winding track to follow which was a little wider than the vehicle but littered with obstacles. The system alerts you audibly but also visually on the dash screen when you are approaching a hazard. It does it visually by highlighting the at risk area and flashing green, amber or red. It is particularly good when you find yourself in a position where you are potentially going to hit a hazard on both sides of the vehicle enabling you to compensate for both and affect a clean passage. Fleet engineers will love that system. The second one I tested was the Rear Traffic Alert. This is designed to counter that ever present hazard of backing out between two closely parked vehicles into traffic. You’ve all been there, you are absolutely blind until you’ve edged the vehicle backwards enough to be able to see the traffic. With this system which is only possible because of the electro mechanical steering system you just reverse slowly and if you are in any danger of being hit by a vehicle on the road the system takes over and stops the vehicle dead. I took my hat off to the chap driving the car because if the system hadn’t worked he would have hit my vehicle. He finished less than six inches off my back corner, but if he hadn’t stopped he would have cleared my vehicle. Finally I tried the Trailer Assist. Some operators use trailers all the time and have drivers skilled in reversing with a trailer on, others do it infrequently and sometimes finding a driver available with the necessary skills can be a pain. With Trailer Assist you engage the system (push button again). You then take your hands off the wheel put your head out of the side window or use your mirrors to watch the back of the trailer. You put your right hand (LHD vehicle) onto the mirror adjustment button which has been modified to have a little joy stick like a PlayStation console. All you do is to concentrate on the back corner of the trailer and make sure it isn’t going to hit an obstacle. The system does the rest, it adjusts the steering to ensure the trailer ends up precisely where you want it. Again the manoeuvres are shown on the dash screen. Some will think all this technology is taking away the driver’s skills and I can sympathise with that view but I have a feeling in ten years time we will think it is the norm. VW have poured a huge amount of money and effort into developing the new Crafter. They very clearly have objectives of increasing their presence in the World’s van and van derivatives market. 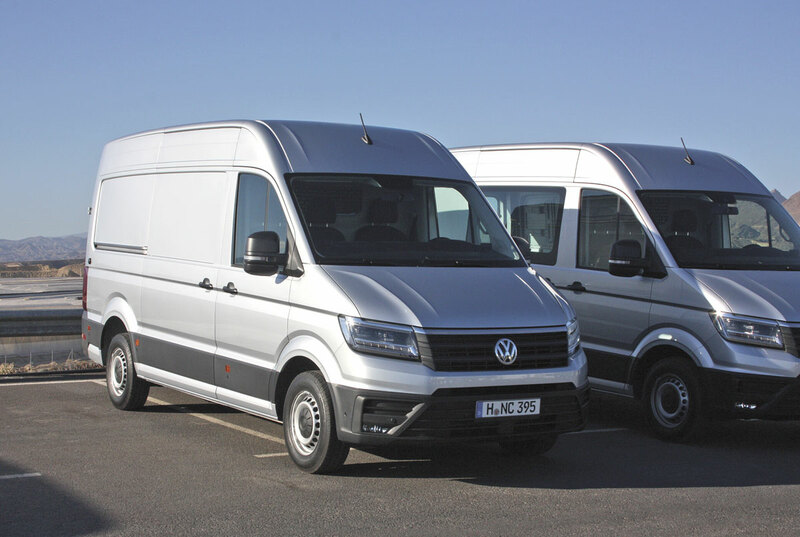 They are clearly challenging the Mercedes-Benz supremacy and judging by my experience with the new VW Crafter, they clearly have the tools with which to do it. I can’t wait for the first right hand drive versions to arrive in the UK (early 2017) and more importantly the 3.5 and 5.5 tonnes rear wheel drive versions (3rd quarter 2017).